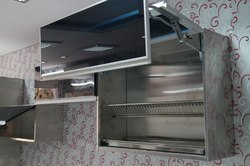 Prominent & Leading Manufacturer from New Delhi, we offer stainless steel kitchen racks. Being perfectly shaped and swift movement of our organization, we are instrumental in offering wide gamut of Drain Rack Units. These Drain Rack Units are made as per the industry norms by utilizing finest grade material and advanced technology. Moreover, these Drain Rack Units are posed with the incredible features the excellent finish, great strength & high durability. According to the customer’s requirements, we offer our Drain Rack Units in different designs, and sizes. We offer these Drain Rack Units to our respected customers at reasonable rates.